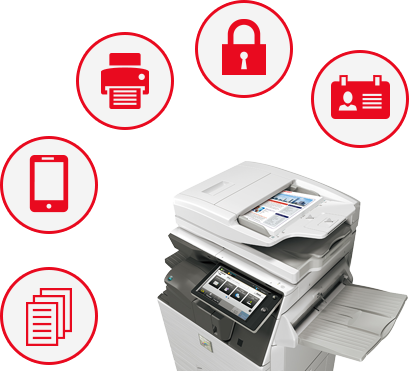 Businesses in today’s interconnected world need more than industry leading printing, copying, scanning and faxing capabilities from their Multi-Function Products (MFPs). They need integrated product offerings that connect their hard copy documents with the applications that manage their business. Our Optimized Scanning Solutions bring speed and efficiency to document capture. Scanning, indexing, filing, distributing, retrieving: all of these time-intensive tasks can be accomplished either automatically, when you’re scanning, or within seconds by touching icons on the MFP’s touchscreen control panel. Document capture has never been easier. Our Optimized Workflow Solutions help everyone in the team to improve efficiency by streamlining repetitive tasks. Now you can scan documents and send them directly to the person, application or business function that needs them.